Currently the Artistic and Musical Director of the Real Orquesta Sinfónica de Sevilla, Mr. Axelrod became also the General Director in July 2017 – an appointment unique in the orchestra's history. Other titles positions include Principal Guest Conductor of the “Giuseppe Verdi” Orchestra of Milan, Music Director of the l'Orchestre National des Pays de la Loire, Music Director and Chief Conductor of the Lucerne Symphony Orchestra and Theater, and Music Director of "Hollywood in Vienna" from 2009-2011, with the ORF Vienna Radio Orchestra. Since 2001, Mr. Axelrod has conducted over 160 orchestras around the world, 30 operas and 50 world premieres. Among his long term relationships with European orchestras are Berlin's RSB, NDR Symphony Hamburg, hr-Sinfonieorchester Frankfurt, Orchestra Sinfonica della RAI Torino, Teatro La Fenice Orchestra in Venice, Orchestra del Maggio Musicale Fiorentino, Orchestre de Paris, Orchestra Svizzera Italiana in Lugano and the Mariinsky Orchestra. In Japan, Mr. Axelrod regularly conducts the NHK and Kyoto Symphony Orchestras. In the USA, Mr. Axelrod has performed with the Chicago Symphony, Los Angeles Philharmonic, and the Philadelphia Orchestra among others. Mr. Axelrod recently debuted to great acclaim with the Bavarian Radio Symphony Orchestra. Recent highlights of Maestro Axelrod’s engagements include debuts with the Filarmonica della Scala, the Prague Radio Symphony, the Netherlands Philharmonic, the Würth Philharmoniker, and returns to the Orchestra del Maggio Musicale Fiorentino, at the Enescu Festival, the Beethoven Festival in Warsaw, and the Pacific Music Festival in Sapporo, Japan where he is the Principal Conductor. 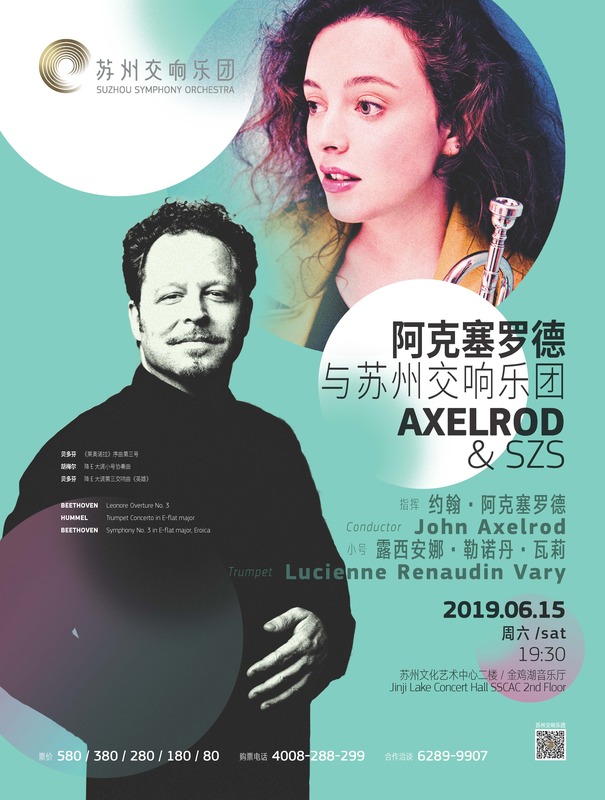 A versatile and critically acclaimed conductor on the opera stage, John Axelrod’s recent activity includes appearances at Théatre du Chatelet, Teatro alla Scala, Teatro San Carlo in Naples, the Rome Opera, Teatro la Fenice in Venice and the Opera of Florence. Committed to working with young professional musicians, Mr. Axelrod has led tours with the Santander Orchestra, the Schleswig-Holstein Festival Orchestra, the Orchestra Giovanile Italiana, the Accademia della Scala, the NordDeutsche Junge Philharmonie, and the Vienna Jeunesse Orchester in Austria. He has recorded core and contemporary repertoire for the Sony Classical, Warner Classics, Ondine, Universal, Na?ve and Nimbus labels. Mr. Axelrod's most recent release is a cycle of Brahms Symphonies combined with Clara Schumann lieder entitled Brahms Beloved on Telarc, with “Giuseppe Verdi” Orchestra of Milan. Winner in the ‘Révélation’ category of the Victoires de la Musique Classique 2016, French trumpeter Lucienne Renaudin Vary became the first trumpet student ever to be accepted in the classical and jazz departments at the same time at the Conservatoire National Supérieur de Paris. Ms. Vary has made concerto appearances with the Philharmonia Orchestra under Paavo J?rvi, Royal Philharmonic Orchestra, Luzerner Sinfonieorchester, Münchner Symphoniker, Netherlands Philharmonic Orchestra, Oulu Symphony Orchestra, Orchestre National de Toulouse, and Orchestre National de Lille. Festival appearances include the Seine Musicale, Salle Gaveau, Annecy Classic Festival, Festival Classique au Vert, Festival d’Auvers sur Oise, Les Flaneries Musicales de Reims, Colmar Fête le Printemps, Antibes Génération Virtuoses, Festival de l'Epau, Gstaad Menuhin Festival, Spivakov Festival in Moscow and Rheingau Musik Festival. Her concert at La Folle Journée Festival with the Ural Philharmonic Orchestra was broadcasted live on ARTE Channel. Ms. Vary appeared on the Stars von Morgen show on the German TV network ARTE/ZDF, presented by Rolando Villazón, in Berlin. Alongside classical repertoire, she is an avid jazz performer, having made her jazz festival debut at Jazz in Marciac, with star-trumpeter Wynton Marsalis.